Koffler Floor Protection will protect any floor with ultra-tough polyethylene that grips the surface to keep all dirt and contaminates out. 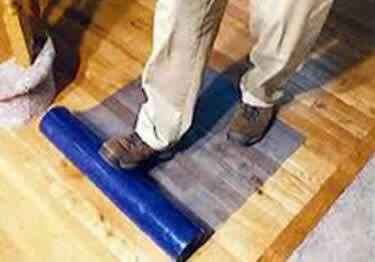 Perfect for protecting all types of floor surface from paint, construction debris, or remodeling damage. Other floor protection film products on the market last only 10-15 days days, but Koffler's protection film offers a full 30 days of protection of protection. Just roll it out, cut it off and you are done! Other smooth surfaces such as stainless steel and polished cement. Just roll it out, cut it off and you are done! When it is time to clean up, just peel up and recycle or dispose with no residue left behind. I am looking for a product the can go on a acrylic tennis court surfaces for protection for a week. Would something like this work or is there another product? Thank You! Hi. The description for your product Floor Film Protection - #A1020 states can be used on 'factory finished hardwood'. Can it be used on hardwood floors that have been refinished at a person's house or will the adhesive do something such as damage to that finish? Thanks in advance for your reply. Floor Protection film will protect any floor with ultra-tough polyethylene that grips the surface to keep all dirt and contaminates out. Awesome product. Highly recommend it over any time of floor film protection I have bought locally. Will buy again!! Reinforced low costprotection for marble, hardwood, tile, & granite surfaces during construction to keep them damage.